The designation of the county or state of the corporation's principal office may be changed by amendment of these Bylaws. The Board of Directors may change the principal office from one location to another by noting the changed address and effective date below, and such changes of address shall not be deemed, nor require, an amendment of these Bylaws. Sidewalk University is organized exclusively for charitable, religious, educational, and scientific purposes, including, for such purposes, the making of distributions to organizations under section 501 C 3 of the internal revenue code, or corresponding section of any future federal tax code. 1. To provide a structured design to create an effective leadership network in the world. 2. To develop a cadre of leaders in the professions, the arts, nutrition & health, economic empowerment, technology, education, business, and government capable of, and dedicated to building communities. 3. Enable individuals to identify the needs of their communities and assist them in developing and implementing programs to address those needs. 4. Promote cultural and social events that will enhance the quality of life, and increase a stronger sense of community. 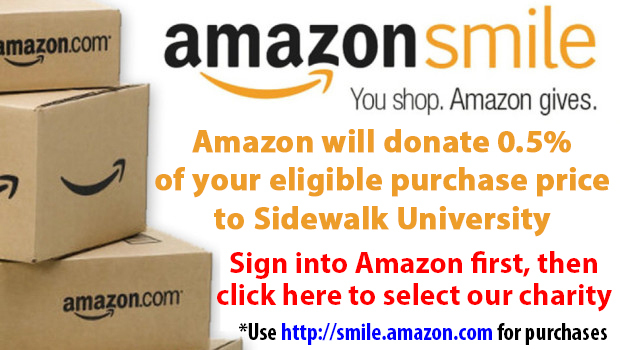 The Sidewalk University shall continue to maintain an affiliation with each of the Sidewalk University affiliate pursuant to the terms of affiliation between the corporation and affiliate. Directors shall be of the age of majority in this state. Other qualifications for directors of this corporation shall be as follows: United States citizen 21 years of age or older who has never been convicted of a federal offense or capital crime. Each director shall hold office for a period of five years and until his or her successor is elected and qualifies. Regular meetings of Directors shall be held on the first Tuesday each quarter at 7:00 p.m., unless such day falls on a legal holiday, in which event the regular meeting shall be held at the same hour and place on the next business day. Directors shall be elected by the Board of Directors. Voting for the election of directors shall be by written ballot. Each director shall cast one vote per candidate, and may vote for as many candidates as the number of candidates to be elected to the board. The candidates receiving the highest number of votes up to the number of directors to be elected shall be elected to serve on the board. b. Special Meetings. At least one week prior notice shall be given by the Secretary of the corporation to each director of each special meeting of the board. Such notice may be oral or written, may be given personally, by first class mail, by telephone or by facsimile machine, and shall state the place, date and time of the meeting and the matters proposed to be acted upon at the meeting. In the case of facsimile notification, the director to be contacted shall acknowledge personal receipt of the facsimile notice by a return message or telephone call within twenty-four hours of the first facsimile transmission. c. Waiver of Notice. Whenever any notice of a meeting is required to be given to any director of this corporation under provisions of the Articles of Incorporation, these Bylaws or the law of this state, a waiver of notice in writing signed by the director, whether before or after the time of the meeting, shall be equivalent to the giving of such notice. A quorum shall consist of four of the members of the Board of Directors. Except as otherwise provided under the Articles of Incorporation, these Bylaws or provisions of law, no business shall be considered by the board at any meeting at which the required quorum is not present, and the only motion which the Chair shall entertain at such meeting is a motion to adjourn. Every act or decision done or made by a majority of the directors present at a meeting duly held at which a quorum is present is the act of the Board of Directors, unless the Articles of Incorporation, these Bylaws or provisions of law require a greater percentage or different voting rules for approval of a matter by the board. Meetings shall be governed by the chairperson, insofar as such rules are not inconsistent with or in conflict with the Articles of Incorporation, these Bylaws or with provisions of law. Any director may resign effective upon giving written notice to the Chairperson of the Board, the President, the Secretary or the Board of Directors, unless the notice specifies a later time for the effectiveness of such resignation. No director may resign if the corporation would then be left without a duly elected director or directors in charge of its affairs, except upon notice to the Office of the Attorney General or other appropriate agency of this state. The directors shall not be personally liable for the debts, liabilities or other obligations of the corporation. The officers of the corporation shall be a President, a Vice President, a Secretary and a Treasurer. The corporation may also have a Chairperson of the Board, one or more Vice Presidents, Assistant Secretaries, Assistant Treasurers and other such officers with such titles as may be determined from time to time by the Board of Directors. The officers of the corporation shall be responsible for the day by day decisions of the corporation. Anyone may serve as officer of this corporation. In the absence of the President, or in the event of his or her inability or refusal to act, the Vice President shall perform all the duties of the President, and when so acting shall have all the powers of, and be subject to all the restrictions on, the President. The Vice President shall have other powers and perform such other duties as may be prescribed by law, by the Articles of Incorporation or by these Bylaws or as may be prescribed by the Board of Directors. The Secretary shall: Certify and keep at the principal office of the corporation the original, or a copy, of these Bylaws as amended or otherwise altered to date. Exhibit at all reasonable times to any director of the corporation, or to his or her agent or attorney, on request therefor, the Bylaws, the membership book and the minutes of the proceedings of the directors of the corporation. The salaries of the officers, if any, shall be fixed from time to time by resolution of the Board of Directors. In all cases, any salaries received by officers of this corporation shall be reasonable and given in return for services actually rendered to or forthe corporation. Meetings of officers shall be held at the principal office of the corporation or at such other place or places as may be designated from time to time by resolution of the Board of Directors. A regular meeting of officers shall be held on the second Tuesday of every month at 7:00 p.m., for the purpose of transacting corporation business as may come before the meeting. Each officer shall cast one vote for any resolutions. Other regular meetings of the officers shall be held as required. If the day fixed for a regular meeting falls on a legal holiday, such meeting shall be held at the same hour and place on the next business day. Special meetings of the officers shall be called by the Board of Directors, the Chairperson of the Board or the President of the corporation, or if different, by the persons specifically authorized under the laws of this state to call special meetings of the members. Unless otherwise provided by the Articles of Incorporation, these Bylaws or provisions of law, notice stating the place, day and hour of the meeting and, in the case of a special meeting, the purpose or purposes for which the meeting is called, shall be delivered not less than seven (4) nor more than fifty (50) days before the date of the meeting, either personally or by mail, by or at the direction of the President, or the Secretary, or the persons calling the meeting, to each officer entitled to vote at such meeting. If mailed, such notice shall be deemed to be delivered when deposited in the United States mail addressed to the officer at his or her address as it appears on the records of the corporation, with postage prepaid. Personal notification includes notification by telephone or by facsimile machine, provided however, in the case of facsimile notification, the officer to be contacted shall acknowledge personal receipt of the facsimile notice by a return message or telephone call within twenty-four hours of the first facsimile transmission. Whenever any notice of a meeting is required to be given to any officer of this corporation under provisions of the Articles of Incorporation, these Bylaws or the law of this state, a waiver of notice in writing signed by the member, whether before or after the time of the meeting, shall be equivalent to the giving of such notice. A quorum shall consist of 50 percent of the voting officers of the corporation. Except as otherwise provided under the Articles of Incorporation, these Bylaws or provisions of law, no business shall be considered by the officers at any meeting at which the required quorum is not present, and the only motion which the Chair shall entertain at such meeting is a motion to adjourn. Every act or decision done or made by a majority of voting officers present in person or by proxy at a duly held meeting at which a quorum is present is the act of the officers, unless the Articles of Incorporation, these Bylaws or provisions of law require a greater number. Each officer is entitled to one vote on each matter submitted to a vote by the officers. Voting at duly held meetings shall be by voice vote. Election of Directors, however, shall be by written ballot. Meetings of officers shall be presided over by the President of the corporation or, in his or her absence, by the Vice President of the corporation or, in the absence of all of these persons, by a Chairperson chosen by a majority of the voting officers present at the meeting. The Secretary of the corporation shall act as Secretary of all meetings of officers, provided that, in his or her absence, the presiding officer shall appoint another person to act as Secretary of the meeting. Meetings shall be governed by the President, as such rules may be revised from time to time, insofar as such rules are not inconsistent with or in conflict with the Articles of Incorporation, these Bylaws or with provisions of law. The Board of Directors may, by a majority vote of its members, designate an Executive Committee consisting of two board members and may delegate to such committee the powers and authority of the board in the management of the business and affairs of the corporation, to the extent permitted, and except as may otherwise be provided, by provisions of law. The Board of Directors, except as otherwise provided in these Bylaws, may by resolution authorize any officer or agent of the corporation to enter into any contract or execute and deliver any instrument in the name of and on behalf of the corporation, and such authority may be general or confined to specific instances. Unless so authorized, no officer, agent or employee shall have any power or authority to bind the corporation by any contract or engagement or to pledge its credit or to render it liable monetarily for any purpose or in any amount. Except as otherwise specifically determined by resolution of the Board of Directors, or as otherwise required by law, checks, drafts, promissory notes, orders for the payment of money and other evidence of indebtedness of the corporation shall be signed by the Treasurer and countersigned by the President of the corporation. The Board of Directors may accept on behalf of the corporation any contribution, gift, bequest or devise for the nonprofit purposes of this corporation. The Board of Directors may adopt, use and at will alter, a corporate seal. Such seal shall be kept at the principal office of the corporation. Failure to affix the seal to corporate instruments, however, shall not affect the validity of any such instrument. Every director shall have the absolute right at any reasonable time to inspect and copy all books, records and documents of every kind and to inspect the physical properties of the corporation and shall have such other rights to inspect the books, records and properties of this corporation as may be required under the Articles of Incorporation, other provisions of these Bylaws and provisions of law. Notwithstanding any other provision of this document, the organization shall not carryon any other activities not permitted to be carried on (a) by an organization exempt from federal income tax under section 501 (c) (3) of the Internal Revenue Code, or corresponding section of any future federal tax code, or (b) by an organization, contributions to which are deductible under section 170(c) (2) of the Internal Revenue Code, or corresponding section of any future federal tax code. No part of the net earnings of the organization shall inure to the benefit of, or be distributable to its members, trustees, officers, or other private persons, except that the organization shall be authorized and empowered to pay reasonable compensation for services rendered and to make payments and distributions in furtherance of the purposes set forth in the purpose clause hereof. Upon the dissolution of the organization, assets shall be distributed for one or more exempt purposes within the meaning of section 501 (c) (3) of the Internal Revenue Code, or corresponding section of any future federal tax code, or shall be distributed to the federal government, or to a state or local government, for a public purpose. Subject to the power of the members, if any, of this corporation to adopt, amend or repeal the Bylaws of this corporation and except as may otherwise be specified under provisions of law, these Bylaws, or any of them, may be altered, amended or repealed and new Bylaws adopted by approval of the Board of Directors.